I had already written this post once and then blogger decided to crash and I had not saved my progress (boo!) So now you get the abbreviated version. A couple of months ago my quilt guild held a really nice workshop. Lucky me it was only $20 for guild members. You can bet I signed up right away. $20 for uninterrupted quilting time with no kids? Count me in any time. Of course it helped that we were going to have an awesome teacher. We had Mrs. Pat Speth come and give us an amazing workshop. There were so many choices for projects to work on. I finally settled on Pat’s Millennium Star quilt. I didn’t really have time to go fabric shopping for the workshop because at that time I was still traveling between two states. So I looked through my stash and found two “12 Days Of Christmas Charm Packs” by Kate Spain. I then quickly drew up the quilt in EQ so I could play with the quilt colors. I settled on adding brown, red, and ice blue to the quilt. I had to pick colors that I knew I would more than likely find at Hobby Lobby since it is the only place to get fabric around here. At least they carry Kona Cottons. The day of the workshop my very awesome hubby took the kids, baby included, for 6 whole hours! Do I have an amazing husband or what?! This was my very first workshop ever. I had an awesome vision of coming home with a completed quilt top. I mean 6 hours of dedicated quilting time? 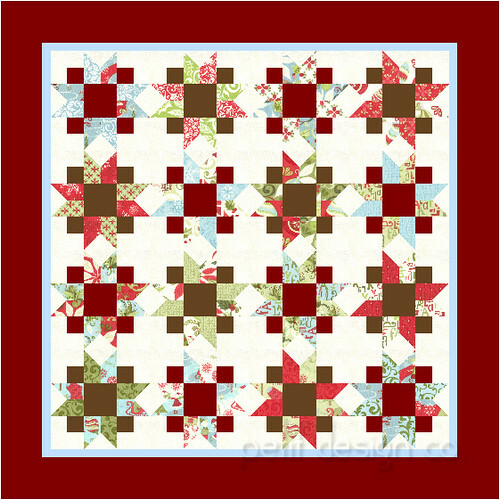 I should have had that quilt top pieced, basted and ready for quilting right? LOL, how naïve I was. I was able to complete 4 blocks. Yup that’s it! At least they were four very well put together blocks. I think I was the one that got the most blocks done. It may not seem like a lot but the rest of the blocks are in a semi-started state so it shouldn’t be too hard to finish up the other blocks, assuming I could ever find another 6 hours of quilting time! I’ll post pictures of my finished blocks soon. What a wonderful husband! The stars look very pretty in the mock up. Whenever I am canning, painting the house, or quilting, I always double the estimated time and then add two hours...lol! a. I didn't know that Hobby Lobby had Kona Cottons.